Perhaps surprisingly, New Zealand Red Rabbits are the very first truly American breed of rabbits. Their genesis is tied in with Belgian Hares much more than it is with a New Zealand breed of rabbits. At the turn of 1900, Belgian Hares were all the rage in the rabbit world. They were being raised throughout the USA, England, Belgium and Europe. Outstanding individual rabbits were bought and sold for thousands of dollars apiece in those days. Given the flurry of breeding, it is not surprising that Belgian Hare 'sports' began showing up here and there, rich red and buff-colored rabbits lacking the correct agouti coloration of a normal Belgian Hare. 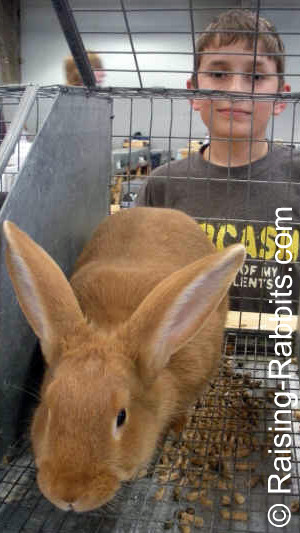 Breeders took these Belgian Hares and crossed them with Flemish Giants. After a few years, the offspring of such crosses were called Golden Fawns. Golden Fawns have long since become extinct, but not before lending their blood lines to additional crosses back to Belgian Hares to enrich the red color. Apparently, according to the late John C. Fehr as quoted by Mr. Bob D. Whitman in Domestic Rabbits and their Histories, crossing Golden Fawns, Belgian Hares, Belgian Hare sports and Flemish Giants was a logical next step in the minds of at least several breeders from east coast to west. They carried out these crosses simultaneously across America, each possibly unbeknownst to the others. 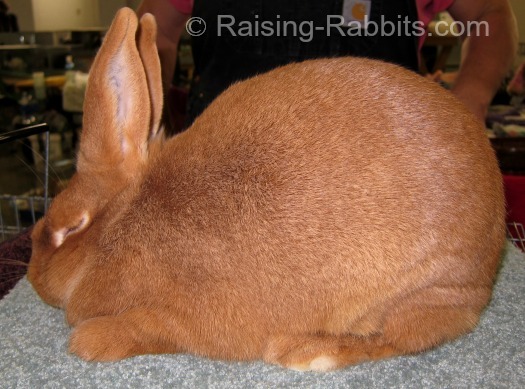 By 1913, breeders in both Indiana and California presented for show several reddish-fawn-colored, meaty rabbits that still retained a Belgian Hare stance on the show table. Despite the origins at different ends of the nation, the rabbits were similar in appearance, though the California rabbits were better in meat qualities. Both strains of 'New Zealands' were together America’s first New Zealand Red Rabbits. 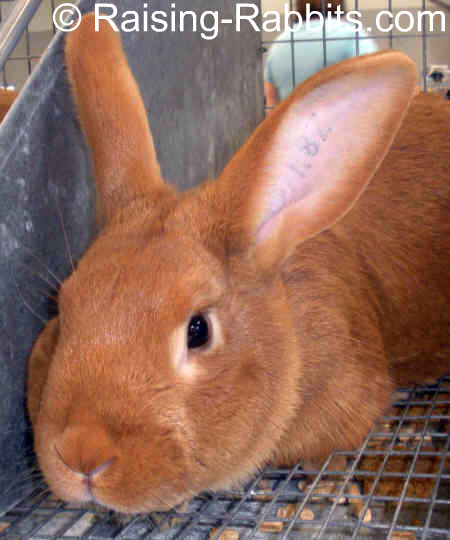 While most breeders were calling their new breed of rabbits New Zealands, some breeders favored the title of California Reds, or American Reds, even entering them in shows under these alternate names. If New Zealand Red Rabbits are American-bred, why are they called by the name of New Zealand? That is thanks to a booklet written in 1918 by Mr. C.P.Gilmore, titled "The New Zealand Red Rabbit." The author mentioned some New Zealand rabbits that were imported from New Zealand to both San Francisco and to Los Angeles. These imported rabbits would eventually be identified with the new, American, New Zealand Red breed, despite the muddy connection. Mr. Gilmore’s story may or may not have been true. We are guessing that probably some rabbits from New Zealand did show up in California. Nevertheless, that the New Zealand Red Rabbit is a concoction of American breeders is not in question. What IS true, is that New Zealand Reds bred in California were frequently some of the best representatives of the breed for many of the early years (1906 - 1925). It is possibly due to the New Zealand-to-California rumor and the excellence of California-bred New Zealands that the name, ‘New Zealand Red Rabbits’ stuck. The count was 10-1 in favor of New Zealands. The year of the vote was 1916, and the name became official, regardless of the actual origins of the breed. The Belgian Hare boom began to wane. New Zealand Reds easily and quickly stepped into the vacancy, perhaps because of their overall versatility. New Zealand Reds began to be everywhere across the USA. New Zealand Reds are excellent meat rabbits. Senior bucks weigh 9-11 pounds. Senior does weigh 10-12 pounds. New Zealand Reds are a distinctive, "bright reddish sorrel, but should not give any 'brown' impression." The belly is somewhat lighter, even deep creamy in color, but never white. The eyes are brown. These are solid, meaty, commercial meat rabbits with normal fur. They've been selectively bred over the years for feed conversion, litter weight gain, maternal instincts, and hardiness. In the UK, the New Zealand Red Rabbit standard of excellence calls for a slightly mandolin (arched) topline, and a weight of 3.62 kg (8 lb). For this reason, among others, the BRC recognizes the New Zealand Red as a separate breed. The BRC standard for the other New Zealand varieties more closely approximates that of the New Zealand Rabbit in the USA. Go to New Zealand Rabbits for more information on the White, Black and Broken varieties, including their history and uses as commercial meat rabbits.